Babes Ride Out Artist Series highlights the talented people in our community. Every artist donates their time and creativity to create a custom piece for the BRO5 Raffle. We are so happy to be able to support Moto F.A.M. through the proceeds of the raffle each year. Moto FAM raises funds for riders that have been hurt in a motorcycle related accident, or the family of a fallen rider. Thank you so much to Biltwell for contributing the helmets for the Artist Series this year! I’m Ana, born and raised in Albania. I started Chasing Wolves with my good friend, Bella, in January 2017 and we’ve been having a great time collaborating ever since. Bella is a tattoo artist at Fiction Tattoo in Woodside, Queens which she runs with her husband, Ken. They specialize in realistic tattoos. Even though I’ve known Bella for 10 years and have always admired her work, it wasn’t until last year that I brought up doing a collaborative project together. At first I was very hesitant because my own work is very abstract (digital paintings) and portrait photography. I wasn’t sure how our styles would mix and I was very new to the tattoo culture. But Chasing Wolves came together quickly and it was obvious from the moment we sat down to draw together that we knew what the brand would look like; clean but dark, a little goth, a little punk and all together inspired by tattoos, our favorite films and music. For Chasing Wolves we custom paint clothing, mostly jackets but not limited to, we design enamel pins, screenprint patches, tote bags, scarves and art prints. We are looking to expand into jewelry making and constantly learning new skills. In May 2017 I walked into Genuine Motorworks in Williamsburg, bought a Gringo S helmet in Gloss Agave and rode on the back of a '93 Suzuki vs1400 all through Queens, Brooklyn and Manhattan. I fell in love with this new feeling and I can't wait until I get my own bike. I had been following Babes Ride Out on Instagram, admiring everything about it and hoping that one day in the near future I would join as well. 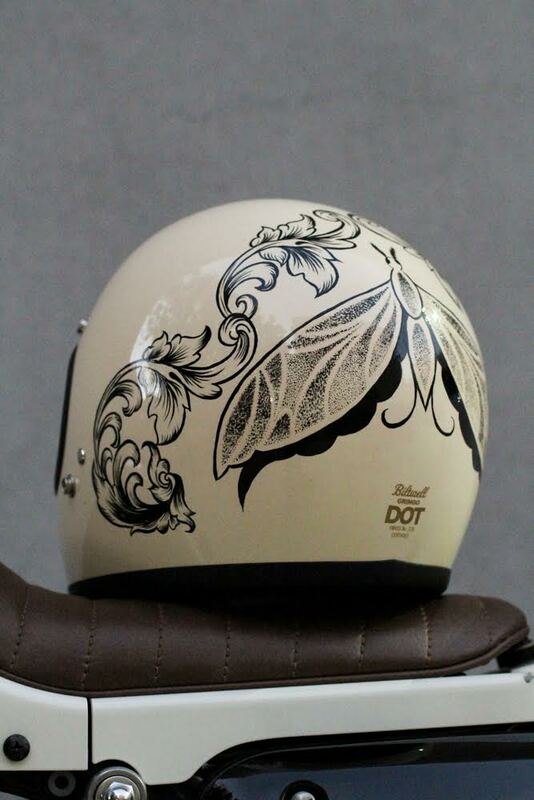 For now I am thrilled that Bella and I will be contributing to the Biltwell helmet raffle this year. After much research and many sketches we are excited to have it ready. While we are very new to the motorcycle world, we are also very excited for this new challenge and all the inspiration we are drawing from it and we hope it incorporate it into our work.